How to Use HandBrake to Rip DVD to MP4/MKV to Fit for iPhone, iPad, Android and Other Devices? All of us have seen the decline of DVDs. DVD sales are worse with every passing year, while streaming services continue to grow. Additionally, more and more computers remove DVD drive. Inbuilt DVD player is also detached from Windows 10. Despite that, DVD ripping is still in demand. For one thing, many people have a lot of old DVDs to backup to digital copies. For another, some people still prefer physical hard copy of favorite movie to digital content. When it comes to ripping DVD, HandBrake is always the first to recommend. Well, how to rip DVD with HandBrake? The most comprehensive guide is already presented below. 1. Download and install HandBrake. HandBrake is a cross platform program, available to Mac (Mac OS X 10.7 to 10.14), Windows (Windows 7 to 10) and Ubuntu. As an open-source DVD ripper, it won't cost you a penny. Simply go to HandBrake.fr - the only official place to download HandBrake - to get a copy fit for your computer and install it following wizard. The latest version is 1.1.1. HandBrake itself can't rip commercially copy-protected DVDs. If you want to use HandBrake to rip encrypted DVDs, you should firstly download libdvdcss - a part of VideoLAN project capable of reading and decrypting DVDs locked by region codes and CSS. In this example I show how to rip DVD with HandBrake on Windows 10, but the principle is the same for other operating systems. Step 1. Load the DVD you want to rip into HandBrake. Insert target DVD into the DVD drive of your computer. Then, open HandBrake and you will be able to see Source Selection where your DVD should be already detected. Click it to open and HandBrake will begin scanning it. Scanning time varies with content on your disc. Step 2. Choose the title you want to rip. Other adjustable options including Angle, Chapters, Seconds and Frames. Seconds is an option used to define the start time and end time of to-be ripped title. If you know little about picture, filters, video, audio parameters, just keep the default settings untouched and instead focus on Presets only. HandBrake empowers you to rip DVD to MP4 or convert DVD to MKV. In addition, it offers dozens of output presets, grouped under General, Web, Devices, Matroska, and Legacy. You can choose any one at will, or add personalized preset by clicking + Add button at the bottom of Presets section. When choosing a preset, don't choose 720p and 1080p presets for DVDs. The resolution for PAL DVD is 720 x 576 (576p), while the resolution for NTSC DVD is 720 x 480 (480p). Choosing s larger preset won't make the output look better but bigger. 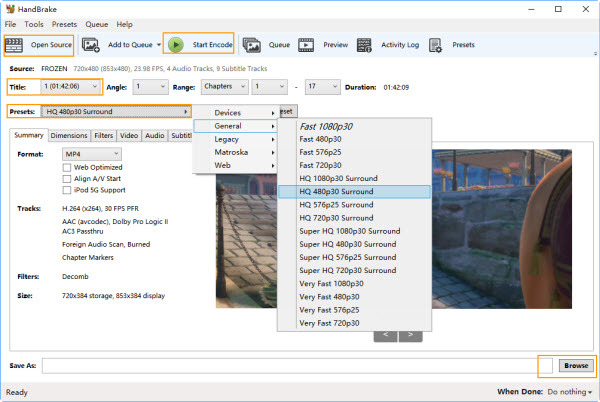 One more thing, "Fast" and "Very Fast" presets will sacrifice some output quality, while "HQ" and "Super HQ" presets will slow the DVD ripping speed and increase output file size. Step 4. Specify the destination to save your output. Navigate to Save As section and then click Browse to choose the location for storing the resulting file and also define the name of output file. HandBrake allows you to rip DVD to computer hard drive or external storage devices. Step 5. Ask HandBrake to rip DVD in no time. If you have nothing to modify, simply click Start Encode button at the top menu bar to start ripping DVD with HandBrake. Then you will see a display bar and can estimate the time remaining to complete. Various problems may occur when we use HandBrake to free rip DVDs. Here, we pick out several common issues. If you fail to rip DVD with HandBrake because of one of the reasons, just head to the solution we provide. Overall, most of HandBrake errors are result from copy protections. And the best way to fix them could be trying a HandBrake alternative like WinX DVD Ripper Platinum capable of processing various encryption schemes. This software supports nearly any DVD copy protection schemes, like general CSS mechanism, Sony ARccOS, UOPs, APS, RCE and Disney X-project DRM. It can rip Disney DVDs, workout DVDs, special Japanese DVDs, and others, without hassle. WinX DVD Ripper Platinum have the advantages not only in wide range of supported DVDs, but also in more well-configured output presets, more output file formats, super fast speed, high output quality, intuitive interface and more.